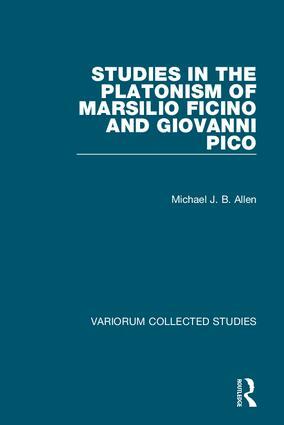 Fifteen of these essays by one of the leading authorities on Renaissance Platonism explore the complex philosophical, hermeneutical, and mythological issues addressed by the Florentine, Marsilio Ficino (1433-99). Ficino was the pre-eminent Platonist of his time and a distinguished philosopher, scholar and magus who had an enormous influence on the intellectual and cultural life of two and a half centuries, and who is one of the most important witnesses to the preoccupations of his age, above all to its fascination with ancient poetry and philosophy and their uneasy accommodation as an ancient "theology" with Christianity. Two further essays treat of cognate themes taken up by Ficino’s younger friend and rival, the dazzling prince of Concordia, Giovanni Pico della Mirandola (1463-94), who was fascinated by Platonism in his youth but also by other philosophical legacies from the past, including Cabala and the Scholastic Aristotelianism of the Middle Ages. This volume’s initial essay serves as an introduction to the comprehensive phenomenon of Renaissance Platonism. Michael J. B. Allen is a Distinguished Research Professor at UCLA and the winner of the prestigious international Galileo Galilei prize for his work on Renaissance Philosophy. This collection is a companion one to his first Variorum volume, Plato’s Third Eye (1995).